Garratt articulated locomotives are the perfect choice to handle the heavy demands made on engines operating on the Welsh Highland Railway’s steep winding route through Snowdonia. Allan George outlines the history of the WHR fleet of Garratts. 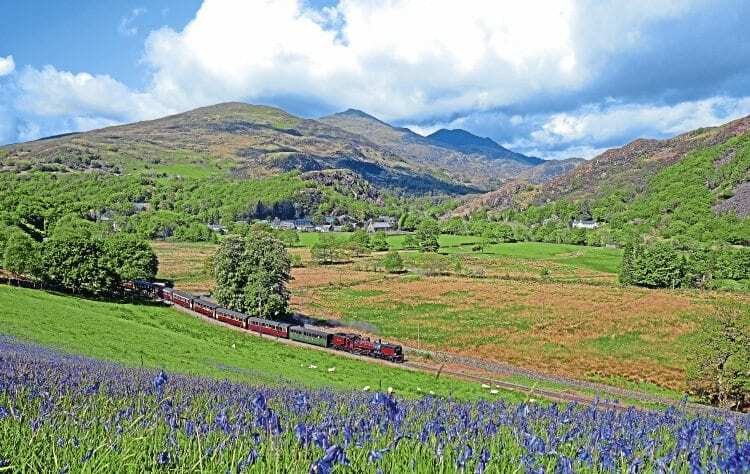 The Welsh Highland Railway runs from beneath the walls of Caernarfon Castle, through the rugged landscape west of Snowdon, to link with the Ffestiniog Railway at Wharf Station, Portmadoc, 25 miles away. And in this testing environment the Garratts are “perfect for hauling the 10 coach trains we run through the mountains”, says Paul Lewin, of the WHR and Ffestiniog Railway. The railway usually has three Garratts in service (two in steam and one standby during the busiest months), with a number of others under overhaul or long term restoration. Their generic design could be seen as a follow-on from the earlier Fairlie locomotives pioneered by the WHR’s sister railway, the Ffestiniog. Garratts are articulated locomotives whose boiler is mounted on a centre frame, with two power units set on separate frames, one on each end of the boiler. They have a water tank at one end, and coal bunker at the other. This design permits locomotives larger and much more powerful than the Fairlies, to negotiate curves way beyond the ability of rigid-framed locomotives. The design evolved at the beginning of the 20th century by Herbert William Garratt, an engineer who worked in the development of colonial and South American railways. The design allows heavy trains to be hauled around the frequent and sharp curves, inevitable in mountainous countryside. Garratt locomotives were used extensively throughout the British Empire and elsewhere in undeveloped parts of the world. The design also did away with the need for doubleheading and hence Garratts were much more economical than alternatives, even on flat surfaces. Read more in Issue 226 of HR – out now!